It’s a rail… It’s a duct… It’s MAXIRAIL! 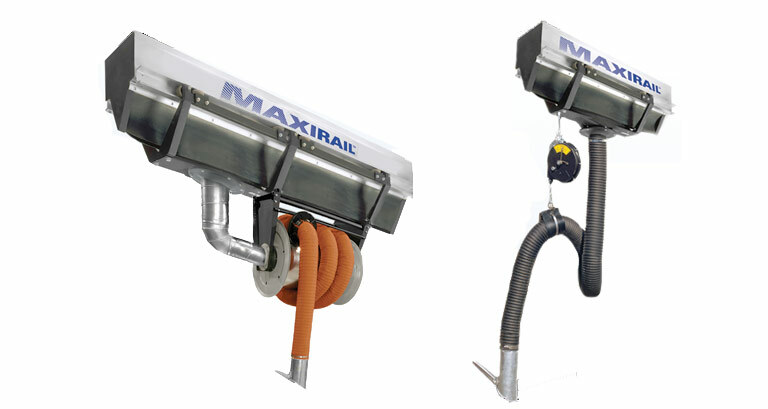 The MAXIRAIL exhaust system is perfectly designed to capture and remove gases, dusts, fumes and other pollutants from the worker’s breathing zone. The sliding trolley can be fitted with a MAXAIR fume arm, MAXIREEL hose reel or most equipment designed for source capture. Constructed from extruded aluminum for durability and to minimize the weight. Multiple trolleys may be installed on the rail and standard joining sections com in 3’ (1M), 6.5’ (2M), 10’ (3M), and 13.5’ (4M). Two (2) different profile sizes are available. Exhaust fans can be installed at either end or top of the rail.